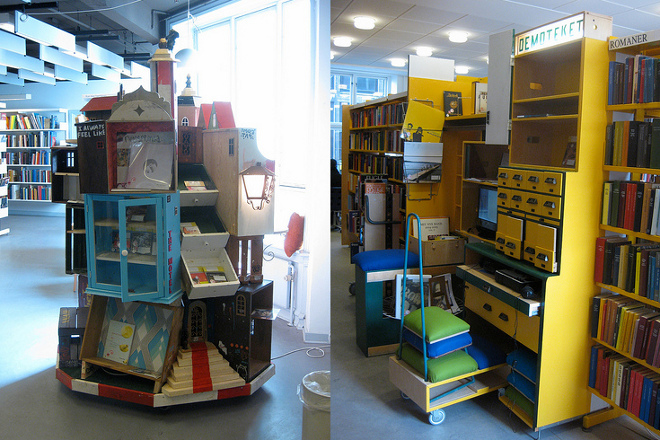 News : Demoteekki - Your Local Underground Library: Bring your works! For Camp Pixelache demo-stalls Demoteket is planning to make a Finnish version of their underground library established in both Denmark and Sweden. Demoteket is based on works by local artists - so please bring your own works along! Music, zines, books, software, drawings - anything goes! The internet has already provided a platform for the democratisation of cultural distribution – at least in its digital form. Demoteket complements this tendency by creating a platform for art in its more tactile and unique forms. A unique cut of a dubplate folded into a homemade silk print cover does have a different sound and charm than most youtube-soundfiles can compete with… In Copenhagen these unique productions have now landed at the age-old bastion of free culture: the public libraries.